Dimensions 11.0 In. X 4.25 In. X 21.75 In. This item description is completely misleading! It is NOT solid brass construction. The entire spray head is plastic with a stainless steel “look”. The toggle to change the water stream is also plastic. My husband, who is usually my voice of reason, even says it will not hold up to our family use. I am disappointed that I will need to continue my search. The size and pull-out features would be great for my large sink. 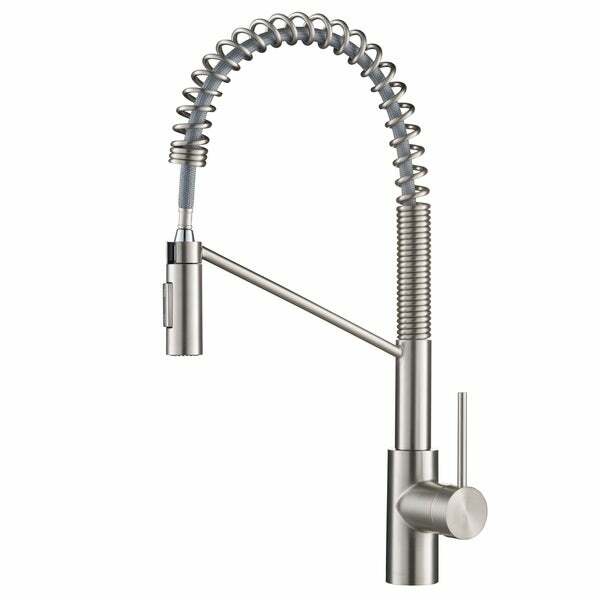 I would recommend this for looks but this is NOT a commercial faucet. 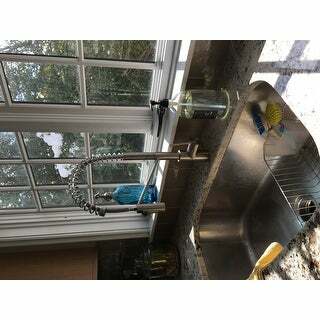 We are very happy with this faucet! We had a licensed plumber install for us—took no time at all. Love the finish on the faucet and the commercial look. Fits perfectly into our new modern kitchen. Would definitely recommend! I was looking for a grand faucet to make my kitchen stand out. This was that faucet. It was easy to install and really provided a classy and industrial look within my kitchen. Very pleased with my purchase! Like the looks and easier to install than most faucets. 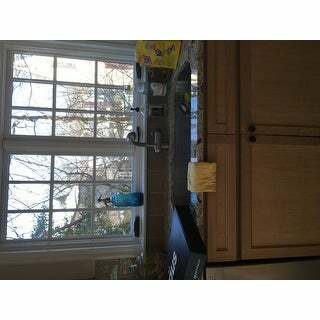 Most of the fastening is done from above the sink. Flow is good. Would recommend this product if the style fits your decor. Installed this in a newly renovated half duplex with a modern, urban design style. It is modern but not super industrial, although it has the urban, industrial flare to it. I like that the nozzle head is smaller and not big and bulky. It can look good in a modern, contemporary kitchen even with a slight industrial flare. This sink looks awesome in my new kitchen. We were very impressed with this product and how easy it was to install. Highly recommended! This is beautiful faucet. It looks sturdy and great quality. It is also stain resistant. It was nice packed and arrived very quickly. Cannot wait to have it installed. I ordered online and a little disappointed with how the faucet control feels in my hand. It's smaller than I expected. However, the size does not affect the spray or ease of control. Looks nice and easy install. The head is plastic which is kind of cheap feeling. Beautiful faucet. Have not used enough yet to comment on functionality but will update once it has been in use for a month. Used with filtered/softened well water so will be monitoring the "spot free" finish. Great faucet. Matches all of my appliances. Has multiple settings for getting all of the sticky stuff off of your plates and pots. Looks great too. I would most definitely recommend this faucet to everyone. it is very solid piece of equipment and I love how it is made. we have not totally installed it yet because of building our house but completely love the manufacturer of this product. you get your monies worth by buying this faucet. This faucet is absolutely beautiful!! We just had it installed today and I LOVE the look and feel of it! Awesome water pressure and very sturdy in feel yet so sleek and unique! I would definitely recommend it and overstock to everyone! I've wanted this Faucet forever!! It's so cool and looks great with my farmers sink. "How much clearance is needed behind the faucet to be able to push the handle all the way to hot?" This model does not have a handle clearance and rotates 90 degrees forward. "Will this fit in a 3 hole sink with1” granite?"